Our goal is to provide weekly collection of yard waste to single-family homes duplex, triples and quadplex units on public roadways. Collection occurs weekly on your trash day except where, due to a holiday or unforeseen circumstances, it is necessary to delay collection by one day. In no case will collection occur on Sunday unless the Township Supervisor has given approval in writing. Yard Waste Collection begins the week of April 1, 2019 and ends the week of December 2, 2019. Yard waste bags or 32-gallon containers with yard waste stickers must be placed within 4' of the roadway and 2' - 4' from other curbside items. If overnight rain is expected, please store yard waste in a dry location and place to the curb before 6:00am on your collection day. 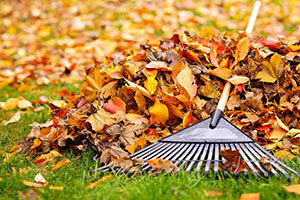 Wet yard waste may be over the weight limit and if so, will not be collected. It is necessary for households to separate garbage from yard waste materials. Yard waste must be in a designated paper-compost bag (available at local retail stores) or in a policy size 32-gallon trash can, metal or plastic container with handles that is designated with Township yard waste stickers. Kraft Paper Bags (yard waste compost bags) with a capacity of 30-gallons and dimensions of approximately 16" x 12" x 35" are acceptable. Such bags are made out of 2-ply 50# wet-strength Kraft paper and are biodegradable. During the colder months, it is recommended to use yard waste compost bags. Leaves that are frozen in cans cannot be removed. If you are using a 32-gallon container, the stickers must be on two sides of the can and facing towards the street so the driver can identify it as yard waste. Stickers are available at no cost in the lobby of the Tilden R. Stumbo Civic Center or by Contacting Residential Services: (734) 484-0073. NO containers over 32-gallons, containers over 50 pounds, yard waste inside a plastic bag, recycle bin, fabricated tubs, stacked containers and/or stacked yard waste bags will be collected. Acceptable: Grass clippings, vines, leaves, weeds, garden debris, shrubs and brush trimmings less than 2" in diameter. The Waste Management yard waste truck will collect bundled brush/branches that are 2" in diameter or less; bundles may be 3' - 4' in length and must be bundled with twine or string. No bundles will be collected over 40 pounds or larger than 18" in diameter. Unacceptable: Miscellaneous waste material resulting from landscaping a residential dwelling which is not appropriate for composting, such as dirt, sod, animal droppings, rubbish, hay, straw, corn stalks, branches over 2" in diameter, stumps, root balls, logs, wood and/or wood chips, rocks, landscaping timbers, all food-type items (i.e. apples, pumpkins, garden foods/etc. ), and concrete (see suppliers in yellow pages for disposal of concrete).